3C294: A cluster of galaxies some 10 billion light years from Earth. Caption: Using Chandra, astronomers have found the most distant cluster of galaxies ever detected in X rays. Approximately 10 billion light years from Earth, the cluster 3C294 is 40 percent farther than the next most distant X-ray galaxy cluster. Chandra's image reveals an hourglass-shaped region of X-ray emission extending outward for some 300,000 light years from the previously known central radio source. 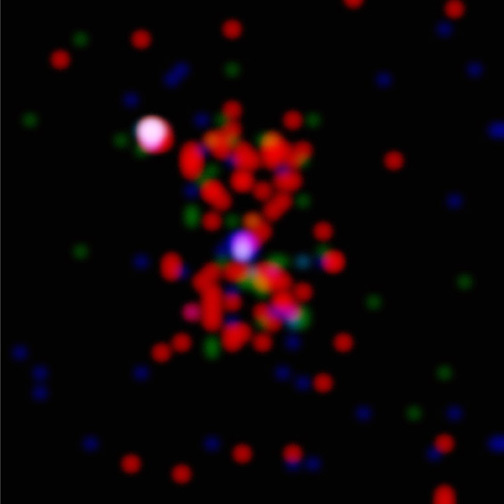 The dots indicate individual X-rays from this very distant source, and the colors indicate their energies, with red for low-energy X rays, green for intermediate, and blue for the highest observed energies. Since galaxy clusters are the largest gravitationally bound structures in the universe, studying such distant clusters provides astronomers with a better understanding of the universe at a much younger age. Scale: Image is 1.2 arcmin per side.